This image is a frame grab from a video showing imaging from an adaptive optics (AO) microscope operating in two-photon excitation (TPE) mode. Imaging shows a membrane-labeled subset of neurons in the brain of a living zebrafish embryo. This image shows what one would see with adaptive optics (AO) and deconvolution turned on. The complexity of biology can befuddle even the most sophisticated light microscopes. Biological samples bend light in unpredictable ways, returning difficult-to-interpret information to the microscope and distorting the resulting image. New imaging technology developed at the Howard Hughes Medical Institute's Janelia Farm Research Campus rapidly corrects for these distortions and sharpens high-resolution images over large volumes of tissue. The approach, a form of adaptive optics, works in tissues that do not scatter light, making it well suited to imaging the transparent bodies of zebrafish and the roundworm Caenorhabditis elegans, important model organisms in biological research. Janelia group leader Eric Betzig says his team developed the new technology by combining adaptive optics strategies that astronomers and ophthalmologists use to cancel out similar distortions in their images. 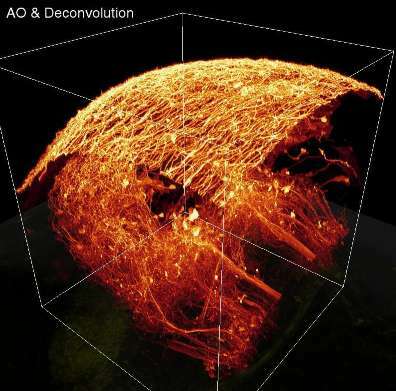 In a report published online on April 13, 2014, in the journal Nature Methods, Betzig, postdoctoral fellow Kai Wang, and their colleagues show how the technique brings into focus the fine, branching structures and subcellular organelles of nerve cells deep in the living brain of a zebrafish. These structures remain blurry and indistinct under the same microscope without adaptive optics. "The results are pretty eye-popping," Betzig says. "This really takes the application of adaptive optics to microscopy to a completely different level." "Our technique is really robust, and you don't need anything special to apply our technology. [In the future] it could be a very convenient add-on component to commercially available microscopes," says Wang, a postdoctoral researcher in Betzig's lab. Over the last decade, Betzig and others have taken a cue from astronomers in using adaptive optics to correct for the light-bending heterogeneity of biological tissues. Astronomers apply adaptive optics by shining a laser high in the atmosphere in the same direction as an object they want to observe, Betzig explains. The light returning from this so-called guide star gets distorted as it travels through the turbulent atmosphere back to the telescope. Using a tool called a wavefront sensor, astronomers measure this distortion directly, then use the measurements to deform a telescope mirror to cancel out the atmospheric aberrations. The correction gives a much clearer view of the target object they want to observe. A microscopy technique that Betzig developed in 2010 with Na Ji, who is now also a group leader at Janelia, achieves similar results by using an isolated fluorescent object such as a cell body or an embedded bead in the tissue as the "guide star." This target is imaged many times from many different angles to determine the correction that should be applied. While this approach works even in scattering tissues such as the mouse brain—where the new technique does not—the process is slow and exposes a sample to a lot of potentially damaging light. To improve images of large samples where the aberration changes quickly with position, researchers needed to speed up the correction process. Betzig and Wang focused on devising an adaptive optics strategy for new microscopy methods that image dynamic processes non-invasively and at high resolution. Such technologies – such as the Bessel beam plane illumination microscope that Betzig's team developed in 2011 and the simultaneous multiview light sheet microscope developed by Janelia lab head Philipp Keller in 2012 – perform well on cells or small embryos, but image quality degrades in larger samples. Those microscopes are used exclusively to image transparent samples, narrowing the scope of the problem. Betzig and Wang needed a rapid, non-invasive way to correct for heterogeneities in the composition of cells and tissues, but because it would only be used on transparent tissue, they did not need to compensate for light-scattering. "If you're in a regime where there is no scattering, then you can do exactly what the astronomers do," Betzig says, explaining that because transparent tissue would not scramble the light waves returned from a guide star, they could detect and measure its wavefront directly. The team created a guide star by focusing light from the microscope into a glowing point within the sample. Using a technique called two-photon excitation, they could penetrate infrared light deep within the tissue and illuminate a specific point. The wavefront sensor would then determine how the light that returned from this guide star had warped as it passed through the tissue, so that the appropriate correction could be applied. However, because biological tissue is so heterogeneous, the situation was more complicated. "In biology, unlike astronomy, the wavefront errors are really complex," Betzig says. "As light from the guide star returns to the sensor, the wavefront gets much bumpier in microscopy than in astronomy. If you fix the guide star at a single point, that bumpiness confuses the sensor, so you don't get a good correction." Furthermore, a correction that works at one point won't be effective at a spot elsewhere in the sample that bends light waves in a different way. The solution to this problem, Betzig and Wang determined, is to scan the guide star over a small region of the sample, instead of parking it in one spot. For the sensor to interpret the information returned from this moving guide star, the light must be made stationary, or "descanned." This is achieved by bouncing the light off the same mirrors that tilt to project the guide star to different points in the specimen. The resulting wavefront is used to generate an average correction over the scanned region. Betzig explains that a similar strategy is incorporated into adaptive optics that corrects images of patients' retinas, which are distorted when light passes through the eye's cornea and lens. Measuring and correcting those aberrations is complicated by movements of patients' eyes, so ophthalmic imaging uses descan to average out motion-induced errors. "We combined the descan concept from the ophthalmologists with the laser guide stars of the astronomers, and came up with what amounts to a really good solution for aberrating but non-scattering transparent samples, like the zebrafish," Betzig says. "We kept on pushing this technology, and it turns out it works," says Wang. "When we compare the image quality before and after correction, it's very different. The corrected image tells a lot of information that biologists want to know." To image a large section of tissue, a microscope might generate and compile tens of thousands of images of smaller volumes, each requiring its own adaptive optics correction. So it is essential that those corrections are determined and applied quickly, Betzig says. The new technique handles the task well, updating its corrections in just 14 milliseconds. And when the microscope is used in its two-photon mode, the adaptive optics work automatically. "You don't have to slow down or do anything different," Betzig says. "It's just happening in the background as you're running the microscope."